lt;stronggt;PAC5296lt;/stronggt;lt;BR/gt;Pacon Medium Weight Tagboardlt;BR/gt;Provide exceptionally strong, multipurpose tagboard to your young artists. It's ideal for a variety of arts and crafts projects, and it works well for chart making, too High-quality, two-sides-one-color design allows for creations where reversibility would be desirable. 9 pt. thickness. 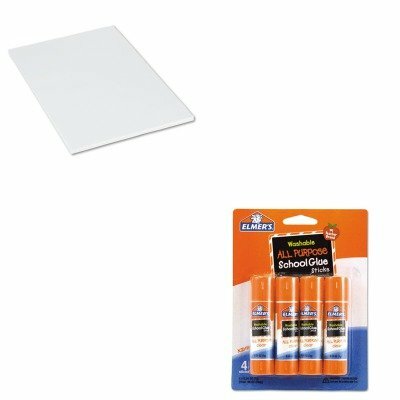 Art Board Type: Tag Colors: White.lt;BR/gt;lt;BR/gt;lt;stronggt;EPIE542lt;/stronggt;lt;BR/gt;Pacon Medium Weight Tagboardlt;BR/gt;Easy to use, easy to clean-up washable glue sticks are a favorite choice for teachers everywhere. Nontoxic so they're safe in the classroom and little hands. Dries clear. Adhesive Type: Stick Color Dried: Clear Color on Application: Clear Washable: Yes.